Ad Schaerlaeckens, Marcel Wouters and the author of this series about Ad Schaerlaeckens. 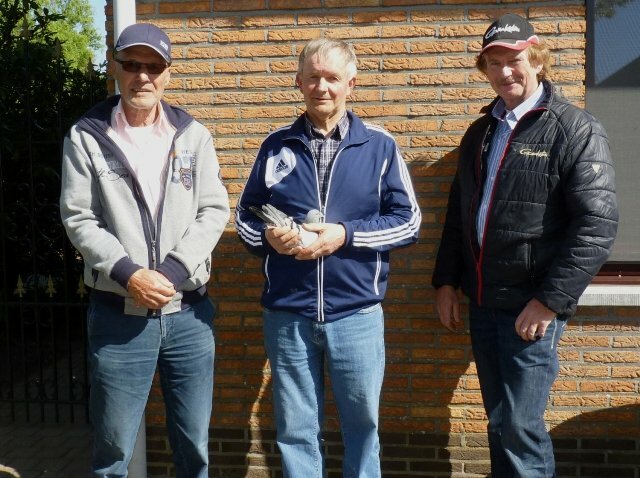 Ad Schaerlaeckens from Baarle-Nassau in the Netherlands is a real phenomenon in the pigeon sport. He received worldwide fame as a writer and as a pigeon racer. In this extensive series, which has been written especially for the sports magazine De Duif, we will go back in time, to describe the start and the construction and expansion of his small, but impressive colony. With Ad Schaerlaeckens as my passenger, I drive over typical Belgian byroads,to the village of Westmalle which, among other things, is well known for its Trappist Abbey. It is also the village where, according to connoisseurs, one of the best Belgian beers is brewed. During our journey, Ad talks the same way as he writes his articles, interesting and informative. He points out old, derelict lofts from the glory days of the Belgian pigeon sport. But also loft-installations that have withstood the test of time, and that uphold the world famous name of the Belgian pedigree pigeons. These are the lofts that until the present day race at the highest level. We are entering the region that is the domain of the stars of old, but also of the present champions of the Belgian pigeon sport. Names that are known to everyone, and at this moment, I don’t want to name a single one of them, afraid to spoil the fantastic pigeon atmosphere of that area. Almost every village that we pass is the home of a great name in the pigeon sport. Ad knows them all by heart, just as he knows their most famous pigeons, and during our passage he recounts scores of them, along with their best achievements. Achievements of which everyone was – and still is- talking about. Via a few road works and detours, we finally arrive at the house that we wanted to come to, the home of Marcel Wouters and his lovely wife Gerda. Seen through my Dutch glasses, Marcel is the prototype of a Belgian pigeon champion. Often not very tall of stature, very friendly, modest and an absolute professional in the pigeon sport. 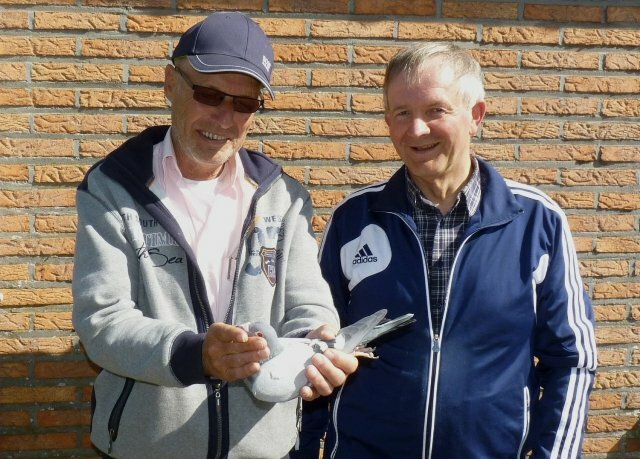 He is one of the pigeon fanciers par excellence who, together with other Belgian colleagues, can have the honour of having played a leading role in the evolution of the modern and super fast racing pigeon. After all, everywhere in the world, most of the successes are still achieved with pigeons of Belgian origin. 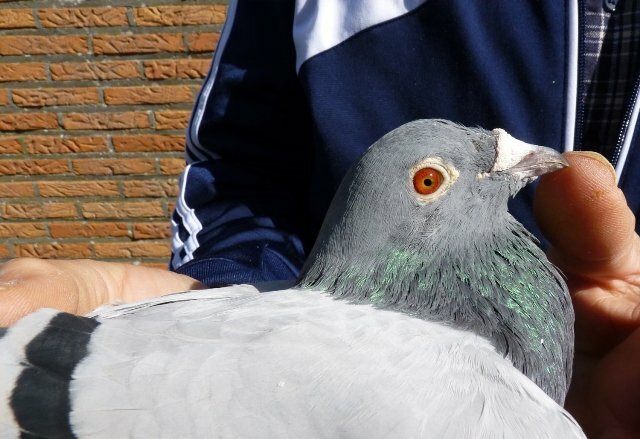 The distinctive head of ‘Den Ad’, best middle-distance pigeon of Belgium in 2013. Because of the huge competition, the quality level remains very high, and the champions push each other to great heights. There is also the fact that, although a lot of pigeons are sold to other countries, many good pigeons and their offspring are kept in the area of origin. When you analyze the pedigrees of the champions, you often find pigeons from fanciers out of the region. When a new champion rises up in the area, you can immediately see that the stars visit each other to exchange pigeons, breed together and more, often without any exchange of money. You also often find the same pigeons in the pedigrees of the modern stars. And the fancier, who succeeds in breeding a new, real star, will for some time stay in the spotlights of the international pigeon sport. The duration of the international interest is usually in sync with the breeding value of that pigeon. The reason for our visit to Marcel Wouters is simple. We have come together with Ad Schaerlaeckens to record another phenomenon with about the same fame for this series of articles. A possibly historic photograph, which captures the essence of everything that this series is about. The incredible breeding value of the bloodlines that Ad Schaerlaeckens has constructed in his lofts during the past decades and which, until today, keep producing super pigeons. We start with ‘Den Ad’ (B10-6251541) who became 1st Belgian Olympiad pigeon Middle Distance in 2013(!). Which was no coincidence, because in 2012 he already became 1st national ace pigeon short middle-distance KBDB 2012, 1st Provincial Ace pigeon short middle-distance KBDB 2012 and as yearling 1st ace pigeon Z.A.V. Ad Schaerlaeckens looks intently at ‘Den Ad’. Marcel Wouters watches, smiling. In other words, you don’t become the best middle-distance pigeon of Belgium by accident, there just has to be royal blood in your veins. And not a pedigree only on paper but proven lines, and that is very true as well. The father of ‘Den Ad’ was the by now world famous ‘Leeuw’ from Marcel Wouters, who had already shown what flying in the lead means, and who became among others 1st ace pigeon of the Union Antwerp. A real crack as a racer, but in the meantime also as a breeder. Already many national lead prizes and even victories have been made with descendants of this super pigeon. love your books and very happy to find this site on facebook. A big fan of Ad’s – Great series of articles for all to treasure!!!!!!!!!! Thanks so much.